As hard as I try to convince myself that having a guilty conscience is not good for me the more I fail and I get into a kind of a sate of inactivity that is laming. So it has been lately regarding my blog and yet I know that it is not entirely true. I breathe, think and dream about food and food combinations endlessly. One of my favourite preoccupations is finding interesting flavour combinations and reading cookbooks and conjuring up my own ideas. The whole process is an organic one in my own case and I know that I have to let things flow more and not bash on myself for not doing whatever. So, I’m going to stop apologizing and give my self permission just to be and write and post recipes when I’m in the mood and inspired. Inspiration comes quite often but the realization is another thing and although I do eat daily and that pretty varied I don’t have my photographer always at my disposal to make beautiful images and then there is the question about the foods photogenic qualities and I can say for the most part food does not always look so pretty. That is , I guess another obstacle I have to overcome and post something maybe not so appealing for the eye but definitely for the palate. One such dish is actually a staple at my table and is a basic bean vegetable stew or chili that looks mostly brown but is a real winner with the entire family. That and many other recipes are in store for you and I hope you’ll be patient with me and stick around for more delicious recipes. Before I move on to todays recipe recipe I’d like to share my own personal journey with wild plants and how I got into incorporating them into my dishes. Some years ago I was reading the newspaper and there was an article that caught my attention about a woman named Gertrude Henzl who had just opened her own shop dedicated to preserving and conserving wild fruits and vegetables. 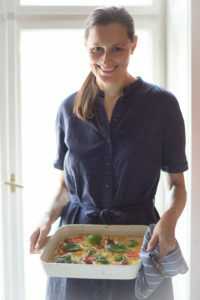 It mentioned how she abandoned her day job to concentrate fully on exploring her passion for wild vegetables and sharing her knowledge with others. It also mentioned that she gave courses and I got so excited that I immediately signed up for one of her courses. We met at a nearby forest to forage for wild plants and then went back to her place to cook it. We made many delicious things but what I remember the most was this amazing pesto using pumpkin seeds and young pine needles. We ate it with grilled polenta squares and it was a revelation for me. We also had many other treats such as a lentil salad with edible flowers and dark chocolate with elderflowers. Besides the health benefits it is so pleasurable to forage your own food and make delicious and beautiful food with it. An added bonus is that you spend time in nature which is also very healing. Needless to say since that course I was hooked and started exploring on my own. Today I know a thing or two about wild plants but I can’t call myself an expert. I mainly stick to the few plants that I know and am familiar with. I did have an unpleasant experience once eating something that was probably not edible but I spit it out right away and I survived. Now I enjoy teaching my children about wild plants that they can eat and it makes our time together so much more enjoyable. They are enthusiastic pickers and are always asking me, “Can I eat this?” and it gives our walks more purpose. This recipe features a wild plant that I haven’t known that long. It is actually called winter purslane, so if any of you know purslane, there are many varieties and this is a winter variety. Purslane has an impressive nutritional profile containing the highest amount of omega-3 fatty acids than any other leafy vegetable plant and in particular alpha-linolenic acid. Wild plants provide much higher concentrations of minerals, vitamins and protein so they are actually suitable for anyone looking to improve their health. Purslane also contains magnesium, calcium, potassium and iron. If you feel like joining the bandwagon, I highly encourage you to get the help from someone who is knowledgable in foraging. Foraging requires experience and attention to details. The beauty about this recipe is its simplicity and the fact that all the components are in season at the moment. 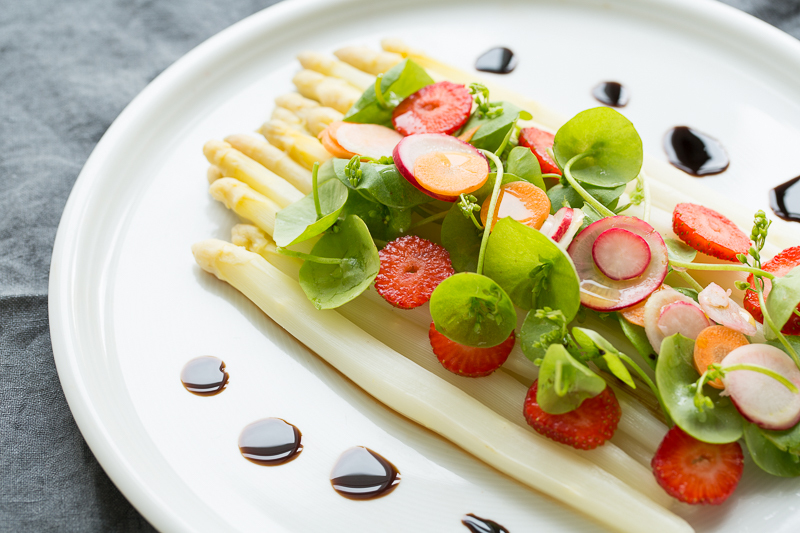 I admit it is a little late for asparagus but in some climates it is still in season, so make a note for the next time its in season and if you don’t have purslane in your region feel free to use any light green leafy salad variety. I imagine rucola or watercress would work here. I also found sorrel which is also a lovely wild plant. Let me know if you try this recipe. I would love to hear if I have awakened the foraging instinct in some of you. Don’t forget to tag me on instagram if you try this recipe #veganart. Have a great day! Wash everything and prepare all the ingredients. Bring 1 liter of water to boil in a large pot. Alternatively use a steamer with a sieve if you have one. I did it in a pot. Add salt to the water and cook the asparagus for approximately 10 minutes, checking to see if they are done. If a knife glides easily then they are done. Drain them carefully in a sieve and let them cool off completely. 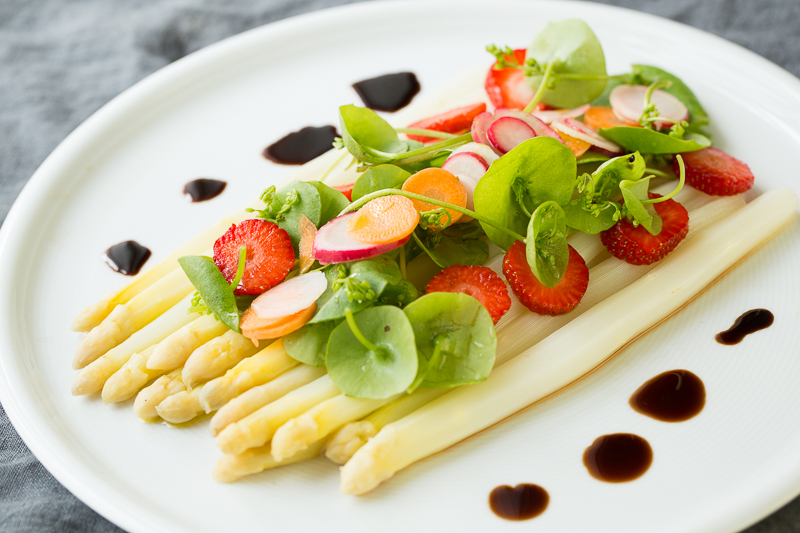 Arrange the aspargus spears on a plate followed by the purslane, radishes, carrot and strawberries. To make the balsamic reduction, heat the balsamic vinegar in a small pot for about 5 minutes or until it becomes thicker or the consistency of honey. Drizzle the balsamic reduction on the salad or beside it. I didn’t on the side so that it looks more aesthetically pleasing.